As parents, we have the primary responsibility to raise our children in the Catholic faith. They will learn how to be Catholic by the way that we live our lives and the way that we model Christian behavior through prayer, almsgiving, and service to others. One certainly does not to be a great scholar to be a good Catholic. It is possible to live a holy life without much recourse to book learning. Nothing can take the place of prayer and loving God and neighbor. However, when one loves God, one naturally wants to learn more about Him. Also, there are many aspects of our faith that our children may question. When we don't have the answers, it is good to know where to look for them. There is also much value in learning about the role models (also known as saints) that the Church holds up as practitioners of the holy life. In helping our children learn more about our faith, our faith is strengthened as well. There is always more to learn and understand. There are many resources available to help you learn about the faith with your children. Every family should have access to the Catechism of the Catholic Church (available online at http://www.usccb.org/catechism/text/index.htm). While it isn't something that you would want to read with your younger children, it is great for looking up answers to questions that you or they might have about why Catholics believe what we do. It would make good reading for teenagers. A copy of the Bible is also indispensable. While the Bible is available online, every home should have a copy to encourage its use on a regular basis. The The New American Bible is the translation that is used for the readings at mass. The The New Jerusalem Bible is also a good choice. A good practice to get into for both adults and older children is to read the lectionary readings for the day. They can be found on the internet at http://www.usccb.org/nab/index.shtml. For younger children, a children's bible is a must. For very young children, Catholic Bible Stories for Children by Ann Ball and Julianne M. Will is a good choice, as is the St. Joseph Catholic Children's Bible by Fr. Lawrence Lovasik. For older children, My First Catholic Bible illustrated by Natalie Carabetta is unique in that it provides child-friendly translations of passages in the Bible and is arranged to be used for devotions. Illustrations are very important in a children's Bible, in that children can often learn much about the Bible stories simply from looking at the pictures. They are also more inclined to spend time with the book if they like the pictures. If at all possible, bring your child with you to a Catholic bookstore so that your child can pick out a Bible of their very own. Stories about the saints are wonderful for both adults and children. They provide examples of how to live a holy life and provide a counterbalance to the “heroes” often held up in contemporary society. The New Illustrated Book of Saints: Inspiring Lives in Word and Picture by Rev. Thomas Donaghy offers one page summaries of the lives of many saints along with a full-page illustration of each one. The Book of Saints series by Father Lovasik offers a similar format, but the books are smaller (32 pages each) and are very child-friendly. There are also books in the St. Joseph series that focus on individual saints. For older children, the Vision Book series published by Ignatius Press is highly recommended. These books allow children and adults to get to know some of the beloved saints more intimately. The stories are exciting and interesting and capture the imagination. For learning about the mass and the faith in general, the St. Joseph series offers books on saying the rosary, attending mass, receiving communion, the works of mercy, and many other topics. The whole series is highly recommended. It is often said that in teaching children, you learn much yourself. I have certainly found that to be true in introducing my children to the beauty of our Catholic faith and traditions. Even though I have a graduate degree in theology and have spent my life as a Catholic, there is always more to learn. I still find the lives of the saints fascinating and with each reading, even of old favorites, I find I gain some new insight. The same holds true with learning about the mass, different devotions, and the truths of our faith. Learning about the faith with your children can be a wonderful journey for all of you! Today's statistics – which state that children with separated or divorced parents are twice as likely as children living in intact families to experience difficulties -- speak to a need for help. A need that only God’s grace and direction can fully satisfy. While not all children experience difficulties as a result of parental divorce or neglect, many note having academic problems, trouble with school authorities or the police, low self-esteem and depression. These children often have more difficulties getting along with siblings and peers also. In adolescence, they are more likely to engage in delinquent behavior including substance abuse, to be involved in early sexual activity, and to experiment with illegal drugs. In young adulthood, they are more likely to have some difficulty forming intimate relationships and establishing independence from their families. Faith Journeys offers three age-directed curricula: 1) for elementary school ages; 2) for middle schoolers and high schoolers, and 3) another for older teens and young adults. These curricula may be used for establishing group programs and retreats at Dioceses, schools, parishes, or community-based organizations. Many years ago, my husband read Life's Little Instruction Book: 511 Suggestions, Observations, and Reminders on How to Live a Happy and Rewarding Life . For whatever reason, the one thing that he got from this book was to always stop at lemonade stands run by kids. 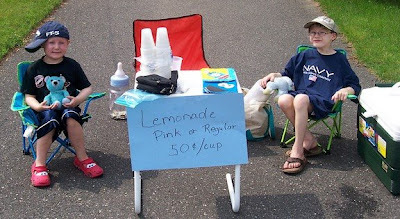 As a result, we have always stopped at lemonade stands and the boys have been begging for ages to set one up. I am not one to stand in the way of entrepreneurial pursuits, but we had a problem. We live at the end of a dead end street. The nearest street that even gets a small amount of traffic is 3 blocks away. Obviously this isn't the best place for a lemonade stand. So, I asked my parents if we could borrow their driveway for the day. They don't exactly live on a main street either but at least they live off of one. The boys and I made posters yesterday and I bought our supplies. They were so excited today. I told them not to be disappointed if they didn't get any customers, but I said a prayer that they would get at least one. Of course, my parents bought some. Thankfully, one very nice lady stopped and bought a glass as did the mailman so they actually got 2 customers! Not a hugely successful venture, but enough to make them feel like they accomplished something. It was fun and something that I hope that they will remember. Last week, our Diocesan Newspaper announced that our local Catholic Book and Gift Store, "The Open Window" would be closing at the end of July. Like so many other independent bookstores, they were the victim of hard economic times, but I feel like I'm losing an old friend. When I was a little girl, my mother used to take me every month when I would have a half day at school so that I could pick out a religious book or item. I absolutely loved our trips and looked forward to them so much. When I got older and my mother couldn't drive anymore, I would take her on field trips to go visit and pick out items that she wanted. I purchased a cross for my husband and my bedroom there when I was getting married. When I was pregnant with David, I went and picked up a couple very simple children's books that I could read to him while he was still in the womb! I admit in recent years, I have been a less-than faithful shopper, often turning to the convenience of the internet to purchase my religious books, but I tried to get there at least a couple times a year with the kids so that they could have the same joy that I had as a child. David and Isaac were sad to hear that the store was closing as well, and so today we took one last trip to say good-bye and purchase a few books and holy cards. Honestly, if I had enough money, I probably would have purchased one of everything! As I looked around, I realized with sadness that it was just nice to know that the store was there if I needed a religious object. While books are easy enough to purchase sight unseen from the internet, the same is not necessarily true for religious gifts. There is now no Catholic store nearby for me to go to purchase a gift for David's 1st communion next year. I guess I'll have to buy something on-line, but it just won't be the same. Good-bye "Open Window" - we will miss you! 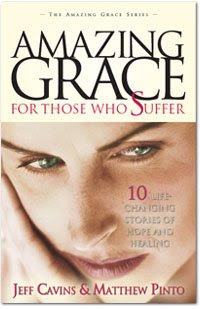 In the introduction to Amazing Grace for Those Who Suffer: 10 Life-Changing Stories of Hope and Healing (The Amazing Grace Series) , Jeff Cavins and Matthew Pinto write "Our lives, no matter how good, are often interrupted and complicated by difficulties. For some of us, the suffering is minor; for others, intense suffering accompanies every heartbeat of every day. . . One thing is for sure: Any type of suffering can take a person to the breaking point." The ten people who share their pain in "Amazing Grace" have faced seemingly insurmountable suffering. Janet Moylan watched her husband and daughter be swept out into the ocean, while she could do nothing to save them. Peggy Stoks suffered molestation at the hands of her grandfather. Mike Clarey's eleven year old daughter was murdered while out delivering papers. Dr. Kim Hardey's son Brad was killed by a speeding car. Debbie Harding faced breast cancer and life married to a drug addict. What all these people share, however, is the knowledge that God brought some good out of their suffering (a fact that can only be seen looking back). Of course, none of us want to suffer, but suffering is part of life on this earth. These ten stories offer lessons in how to suffer, how to understand suffering, and how to continue to trust in God even when we are suffering. The Faithful Traveler™ is a fun, new travel show with a Catholic focus. Join Diana von Glahn, the show’s host, on her quest to discover amazing churches, shrines, and places of pilgrimage throughout the United States and beyond! At each location, she’ll uncover and discuss the art, architecture, historical fact, Scripture, and Church teaching behind the location in a fun and lively manner that’s sure to appeal to all ages! Explore the site to learn more about the show, watch clips from our video series, read what people are saying about the show, and check out the resources behind what is discussed on each show. I have spent this afternoon and evening watching the U.S. diving and gymnastics trials for the Olympics coming up in August. These young people have spent their entire lives working and preparing for this moment. They have gone over every move thousands of times. They have focused and trained and they and their parents have sacrificed to get them where they are. For a few moments the world’s eyes will be on them, admiring their artistry, their grace under pressure, and their determination. Sports and competition have been part of the human experience since the first two children decided to see who could run the fastest. God made human bodies capable of doing amazing things, and he created some people with truly astounding athletic gifts. Even those of us who were blessed with less athletic ability can enjoy sports. Each of us can help our bodies be strong and healthy and enjoy friendly competition. For most of us, participating in sports is not so much about winning or losing as it is about taking part, trying to improve, and making use of the bodies God gave us. Sports can also help us in our spiritual life. The discipline it takes to sacrifice and train and practice and focus is similar to the discipline it takes to sacrifice and pray daily and focus on living the Christian life. Even St. Paul compared his spiritual journey to an athletic experience: “I have fought the good fight to the end; I have run the race to the finish; I have kept the faith.” 2 Timothy 4:7. More recently, Danny Abramowicz, former player for the New Orleans Saint and longtime NFL coach, compared strengthening one’s spiritual life to strengthening one’s physical condition in “Spiritual Workout of a Former Saint” (Our Sunday Visitor, 2004). He advocates getting the Holy Spirit as one’s personal trainer, scouting out the enemies of the spiritual life, stretching out in prayer, running away from temptation, receiving spiritual nutrition, and resting in the spirit. Those who have the responsibility for coaching young athletes, especially through Catholic organizations, have a unique opportunity to connect sports with spiritual formation. The National Center for Catholic Youth Sports (www.nccys.org) encourages Catholic coaches to have a strong foundation in their faith and to use sports as a means of catechesis and spiritual development. NCCYS states that the following should be the goal of any Catholic sports program: “To empower young people to live as disciples of Jesus Christ in our world today, to draw young people to responsible participation in the life, mission and work of the Catholic faith community, and to foster the total personal and spiritual growth of each young person.” Parents as well have the duty of instructing and modeling good sportsmanship and the integration of sport and faith. The Olympics provide a unique opportunity to reflect upon the role of sports in our lives. They offer the chance to appreciate the beauty of sport as well as the incredible stories of the athletes who have the honor of competing. They can also inspire us to get off the couch and increase our own athletic efforts. The most important race of our lives, however, is not the one that takes place on a track and field course, but rather the journey we take towards God. St. Paul instructed the Corinthians to “run to win” (1 Cor 24). May the lessons learned from sports help propel us to that greatest victory, union with God in heaven. But seek first the Kingdom of God and his righteousness, and all these things will be given you besides. I admit, this is one of those Gospels that I have always had a hard time with. I certainly agree that worrying doesn't do us much good. Yes, it is prudent to prepare for life's uncertainties, but constantly worrying about what might happen isn't conducive to enjoying the present moment. The message not to worry doesn't trouble me. What does trouble me is that God promises that He will provide, and yet so many in our world are not provided for. So many in our world are starving. And so, the question becomes how we balance the message of this Gospel with the reality of our world. I do believe that God provides. After all, everything that we have is a gift from God. Without God's providence, we would have nothing. We also have free will, however. We (all of us) have a moral obligation to provide for our hungry brothers and sisters. While God certainly good make all the world's problems go away in a heartbeat if He chose to do so, He chose to give us free will and to make us responsible not only for ourselves, but also for each other. My goodness, how often do we as individuals and as a society screw that up? I certainly don't have the answer to world hunger, but I do know that we are each called to do our part to feed the hungry. God does provide, but He uses us to help the process. Why some people live in extreme poverty and others live in affluence is one of those mysteries I don't think I'll understand this sign of heaven. This Gospel will continue to trouble me, and I will continue to try to do my part to help those who are hungry by supporting my local food bank and praying. It isn't enough, but at the moment it is all I can do. Today was David's last day of school. While he was happy to be done with the year and free for summer vacation, he was sad to be leaving his friends and his teacher, especially because he knows he isn't going back next year. I know that is normal. He wants to go back to school for 3rd grade. I told him we would see, which is an honest answer. I have mixed emotions as well. It is hard for me to leave the familiar path of sending my children to school. It is hard for me to be different, although there are more and more home schoolers and I have received nothing but overwhelming support. At the same time, I am excited about this new venture. I have no idea how this year of homeschooling will go. I only know that for whatever reason, God wants me to do this for this year. I've learned in my life not to plan too far ahead. While some people can make five-year plans and carry them through to fruition, I have found that God usually has some bend planned for my road. So, we will take this coming year day by day and see what happens. I'll keep you posted! Suffering is indeed a great mystery, but the Lord has revealed to me its secret. It is all about love. If we look beyond the suffering of the cross, beyond the nails in His hands and his feet, we will see love. That is why today we wear the crucifix - to remember the love that Jesus' sacrifice took. We must never forget. If we attend Mass, for example, and witness His suffering for us in the sacrifice, yet walk away from it not transformed it Him, not ready to go out and love, then we have missed the whole purpose of the Mass. That is why I believe suffering is unique when it takes place in a visible way. It becomes a transforming sign of love. If I suffer in a manner that can be seen through my life, I can show the world that when we live in Christ, although we may look weak, in Him we are strong! Does Googling Make Us Stupid? Leonard Pitts has written a very interesting article on Does Googling Make Us Stupid?. He is responding to an article in "The Atlantic" which talks about how our attention spans have shortened because of the internet and the ease of getting information. We are now programmed to scan information quickly, searching for what we need, rather than pore over books. Now, I don't think anyone involved in scholarly pursuits would like to revert to needing to do all that research by the labor-intensive methods we used to need. I love the ease of being able to find what I am looking for with a few key strokes. It sure beats hours spent in the library only to discover that what you need is actually in a library in Europe! It is also helpful for answering all those random questions that my children come up with that I don't know the answer to. When I say, "I don't know," they immediately ask if we can Google it. Still, I think it is true to say that we have been accustomed to sound-bites of information. I still read a lot of books (as regular readers of this blog are aware), but reading often does feel like a guilty pleasure. After all, if we can get the information we need in a three paragraph blog post, it seems like a waste of time to read a 200 page book. I agree with Pitts that there is value in taking the time to read the longer version, to develop ideas, and think about complex issues that can't necessarily be addressed in a short article. So, yes, we need and love Google (and the various other search engines which have made life so much easier), but we need to remember how to assimilate larger blocks of information. Like any other skill in life, that takes practice. We need to continue to read books and to teach our children to do so as well. My older son David (age 7) has always been very fearful. He somehow got an extra dose of the “cautious” gene. This can be a good thing. After all, I feel fairly confident that he will never decide that racing his car or jumping out of airplanes are good ideas. When his fear stands in his way of his accomplishing tasks that aren’t dangerous and that he actually wants to do, however, it is my job to encourage him and help him overcome his fear so that he can do these things. Yesterday, he and his brother were playing on the monkey bars we have in our backyard. They haven’t mastered getting across yet, but they like to see how long they can hang and then fall into my arms. I told them that they are actually big enough now that they can drop to the ground themselves and not get hurt. David was terrified. He really wanted to try, but he was so scared. He was having a full-fledged argument with himself about whether to attempt this or not. His brother successfully accomplished the task, but even that wasn’t evidence enough for him that he would be OK. He asked for a cushion on the ground. So, I went inside and grabbed a soft chair cushion and put that on the ground for him. Then, he was willing to try. As it turned out, he actually missed the cushion and landed on the ground, and he was just fine. He was so excited to have accomplished this task! He and his brother took turns for quite a while hanging and falling and were having a great time of it. David talked the rest of the night about how he had fought his fear and won. He was so proud of himself. Today was his turn to help me face my fears. Each summer at my parish we have a program in which parishioners are supposed to visit and bring flowers to one of our homebound parishioners. It is optional. You have to pick a name to take part. Doing this terrifies me. I am an extremely introverted person. I can write a letter to anybody, but actually talking to someone I don’t know takes every ounce of my courage. Last year, the boys wanted to take a name, but they didn’t quite understand the process. I wrote a note and bought the flowers and stopped by the person’s house, praying that they wouldn’t be home. They weren’t. I left the flowers and note and hoped that they got them. This year, my children “get it.” I told David I really didn’t want to take a name this year, but he was insistent. “Mom, it makes God happy to visit someone who is sick. You have to take a name.” Of course, he was right. After mass, we took a name. While I am already stressing about this, with God’s help, I am determined to conquer my own fears and carry out my appointed task. It’s time for me to take the same advice I’m always giving my child. Susan Lawson of Growing with the Saints wrote me to tell of their Catholic Vacation Bible School Programs. For any of you involved in planning Vacation Bible Schools, this looks like a program well worth looking into. Children will embark on a journey to discover the mysteries of the timeless Virtues with St. Brigid of Ireland, St. Nicholas of Myra, St. Juan Diego, St. Martin De Porres and Blessed Kateri Tekakwitha. The exciting Mystery Key Hunt is sure to be a winner. In the "Glimpse of Heaven" Skit, children will witness a gathering of saints and their "storytelling" adventure with Jonah. Kids will hear Jonah's tale about his scary meeting with a huge whale and what can happen when one says NO to God! Set Sail with St. Patrick & the Holy Trinity Children set sail with St. Patrick, the first Bishop missionary, and travel with him on his quest to spread Christianity to the dangerous & ungodly country of Ireland. They will experience first hand the all-knowing, all-loving, and all-powerful Holy Trinity. Teens will join the Adventures of St. Patrick cast, and the pirates are sure to capture the children's attention. They will be enthralled as Victor, a Guardian Angel disguised as a bird, flaps his way on to the stage. Children will encounter exciting characters from the Bible whose lives were transformed when visited by an angel. They will discover their own Guardian Angel and meet the Queen of Angels. While highlighting the Annunciation & Archangel Gabriel, children will hear about the role of our Blessed Mother in Salvation History. They will see how Heaven is present at the Holy Eucharist, including angels and saints. Through the inspirational story of St. Catherine, children will know the Power of Prayer and the Miraculous Medal. Children will NEVER forget the "Battle in Heaven" Skit! Thanks to Lisa Hendey for passing along the link. We often look for God's voice to manifest itself in some large, flashy way, like a bolt of thunder. Like in this scripture passage, however, God's voice is often much quieter, a whisper even, and we need to be quiet as well to hear it. Where is God's message for you today? I know this post is a bit late for Father's Day gift giving, but Me and My Dad! 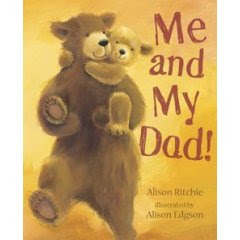 by Alison Ritchie is a charming book celebrating Father-Child Relationships. In an era in which Fathers are often seen as optional, it is refreshing to read a book that recognizes just how important and special that relationship can be. It is a great read for children (and those that love them) any time of year. Even though my children will be home schooled next year, my husband and I continue to be supportive of Catholic schools and will continue to volunteer our time and contribute our financial resources. If you went to a Catholic School and it is still open, please consider making a donation to say "thank you" and help provide a Catholic education for a new generation. If you have a Catholic School in your parish, please support it. Perhaps most importantly, pray for our Catholic Schools and for the teachers who work in them. Prayer can indeed work miracles. Isaac graduated from Pre-K today. It was really a very cute ceremony with the kids singing one song from each month that they were in school and then getting their certificates. Isaac sings with such enthusiasm - you could definitely hear his voice! David will get out of school on the 18th. We got our school books in for next year last Wednesday. It was very exciting! The boys had such fun looking over all the materials. I was a bit intimidated by the teacher's manuals and extensive lesson plans, but I soon realized we don't have to do everything that is listed there. The plans are there to provide options, not to be slavishly adhered to. Overall, I'm really very pleased with the quality of the materials and feel confident that my children will receive a solid education. It is 100 degrees here today. I can only remember a handful of times we have hit that milestone here in Massachusetts. Please say a prayer for those who are suffering from the extreme heat, especially the sick and elderly. Thanks go out to my friend Martha for sending me the link to Bible Gateway which provides an easy to use interface for accessing different versions of the Bible on-line. It's great for a quick look up of a Bible verse or for comparison purposes. 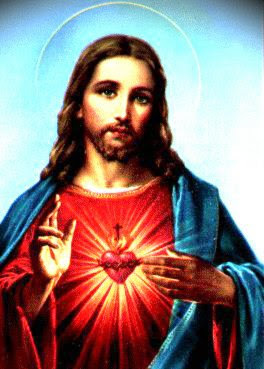 According to “The Catholic Encyclopedia,” devotion to the Sacred Heart of Jesus began in earnest in the 11th and 12th centuries. The idea of worship of the wounded heart came out of the “fervent atmosphere of the Benedictine or Cistercian monasteries, in the world of Anselmian or Bernardine thought”, although no direct evidence exists to point to where it originated. An important development in the history of the devotion occurred when St. Gertrude (d. 1302) experienced a vision on the feast of St. John the Evangelist. “Allowed to rest her head near the wound in the Saviour's she heard the beating of the Divine Heart and asked John if, on the night of the Last Supper, he too had felt these delightful pulsations, why he had never spoken of the fact. John replied that this revelation had been reserved for subsequent ages when the world, having grown cold, would have need of it to rekindle its love.” For the next three hundred years the devotion was practiced, but not in any formal way. It was primarily a private devotion. Here is a good blog post over at "Inner Fulfillment" for those days when we feel we just can't go another step. 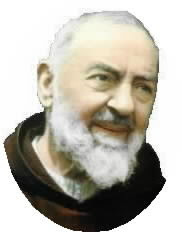 Padre Pio was born Francesco Forgione in Pietrelcina, Italy on May 25, 1887. At age 15 he joined the Capuchin Franciscans. Even at a young age, he was afflicted with health problems. Despite this, he was ordained a priest on August 10, 1910. After celebrating Mass on September 20, 1918, Padre Pio received the stigmata, the same wounds that the crucified Christ bore. Doctors believe that for the next 50 years, he lost nearly a cup of blood a day. More important than the stigmata, however, was his reputation for holiness and his ability to read souls. He received letters from people all over the world seeking his counsel and heard confessions up to 16 hours a day. He died on September 23, 1968 and was canonized on June 16, 2002. Merciful God, through the intercession of the beloved saint, Padre Pio, restore me to health. Help me to know the great compassion he offered to everyone who came to him in sorrow or need. When I am heavy burdened, give me strength. When I am wearied by life's dificulties, uplift and renew me. When I am ill or troubled, lead me to rest secure in Your infinite goodness. Hear now my humble prayers for complete health of mind, body and spirit. Send your Holy Angels to watch over me, to protect me from all danger, and to keep me safe from any injury or harm. O Divine Healer, by Your grace, free me from useless anxiety, and grant me a sense of serenity and well-being in this time of uncertainty. Like Padre Pio, help me, Lord, to trust in You completely, and to experience in my life your miracles of healing, hope and peace. I pray You will be my comfort, my strength and my joy, now and for all eternity. Amen. With Summer coming and the kids being out of school, cries of "There is nothing to do!" will soon be heard across the land. 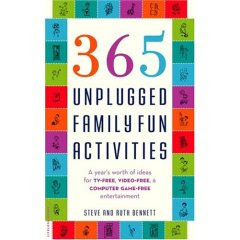 365 Unplugged Family Fun Activities: A Year's Worth of Ideas for TV-Free, Video-Free, and Computer Game-Free Entertainment by Steve and Ruth Bennett comes to the rescue! This book promises a year's worth of ideas for TV-free, video-free, and computer game-free entertainment and it delivers. With this book as a guide, your kids can go on adventure treks through your house, play edible tic-tac-toe, practice cup-stacking, create a newspaper about things going on at home or in your neighborhood, paint coffee filters, or create a video cooking show, and so much more. Many of the ideas are educational and all are fun. I'm sure to use many of the ideas with my children this summer. It is so easy to get caught in the competitive trap of motherhood. It is only natural, I suppose, to compare your children to other children to see if they have achieved the milestones that they should have. It is when you start to feel either badly about it (why is my child so slow? I must be a bad parent.) or smug about it (my child is so smart; I must be a great parent!) that you run into problems. I know, I have been guilty of this myself. For example, last year I used to take care of a friend's son on Monday afternoons. He was five years old and could buckle himself into the car with no problem. David, who is five months older than him, couldn't. This bothered me so much. Why? It is such a silly thing to get upset about. David learned how to buckle himself in when he was six. Will this have a profound effect on his life? I don't think so. At the time, however, it was a big concern to me. I was convinced the boy would be 18 and I would still have to buckle him in. I like to think as I travel along my parenting journey, I am getting a better perspective. I'm more able to see the big picture. It isn't life or death if my child is behind, and if my child is ahead, that's great. I try not to brag about it, though, because I know that there are things that he will struggle with. For example, Isaac, who is 5, is a math whiz and can read very well, but he can't pedal a bike. For some reason, that skill completely eludes him. I would certainly like him to learn how to ride a bike, but I try not to stress about it. Children learn at different rates. Working Mother published an article in their May 2008 issue on raising children with disabilities. This lesson is all the more important for moms of children with special needs to realize. Jonathan Kaufman, president of "DisabilityWorks", states, "Children with special needs may develop at a different pace, but this isn't a race, and you don't need to come in first." Kaufman recommends the book Leo the Late Bloomer by Robert Kraus. "This story about a young lion who can't do things as quickly as other cubs often helps people come up with a new definition of their child's success." I think that this is an important lesson for all parents, and one I'm continuing to learn. My children and I are all works in progress. We all have our strengths and weaknesses. My job, as their mom, is to help them make the most of who they are and become the people God wants them to be. Raising children isn't a race. It is a wonderful journey. "Thinking Over" by Dana Glover is one of my all-time favorite songs. I was poking around YouTube tonight and came across this video of it which puts a very Biblical take on it. The song is about prayer to God to make the right decision about getting married, but this puts it as a bigger life-decision making song. At the Children’s Mass this week, our pastoral minister handed out small rocks with crosses on them to serve as a reminder to the children to build their house (their soul) on stone. She had spoken with them about the things that cause their houses to be built on sand such as lying, disobeying, fighting and cheating, and the good, holy things that help build their houses on stone such as prayer, being helpful, and listening to their parents. Even though I am not a child, I enjoy the children’s homilies very much, perhaps because they get down to the basics. Of course, our faith has to evolve as we get older. Life becomes more complex and our belief needs to adapt to that. The world is not so nearly black and white. There are important decisions to be made. There is work to be done and responsibilities to attend to. It is so darn easy to get stuck in ethical muck, where the distinction between right and wrong does not seem so clear. Yet, what if it really is as simple as children believe it to be? I know it is not easy to be a child. I committed lots of sins as one and I see my children struggle with doing the right thing as well. Knowing the right thing to do and doing it all the time are two different things, no matter what our age. Children, if they have been taught properly, do have a very defined sense of right and wrong, however. They don’t see very many shades of gray. When someone does something wrong, they are quick to point it out, no matter how small the offense. They do know what things will build their houses on stone and what will build it on sand. What about us? Perhaps we need to get back to basics as well. Perhaps we need to be like the little children that Jesus calls to him. Perhaps we need to get back the strong sense of right and wrong we had when we were young and do our best to do the right thing. We need to weed out the rationalizations that allow us to do the wrong thing and think that it is OK. We need to strengthen the habits that allow us to stay on the straight and narrow path. We need to focus on prayer, and following the commandments, loving our neighbor, and giving to the poor. If we do that, then we, too, will have built our homes on stone, and the turmoil of the storms around us will do us no harm. SPRINGFIELD – The cause for beatification of a Springfield-born priest, Passionist Father Theodore Foley, officially opened May 9 in Rome. 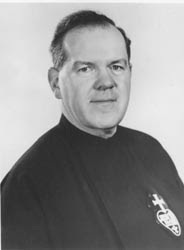 Father Foley, a native of the North End neighborhood here, was the superior general of the Congregation of the Passion, commonly known as the Passionists, from 1964 until his death in 1974. “There are a lot of saints in western Massachusetts, most of them known only to God, their close family and friends. Here we have the possibility of a saint with a capital ‘S,’ and that’s a great tribute to the people of the diocese,” said an enthused Springfield Bishop Timothy A. McDonnell. Widely admired within Passionist circles during and after his lifetime as a capable and diplomatic administrator of his congregation during perhaps the most tumultuous years of its history, the priest is now being more recognized as a holy and humble man by the wider church, members of the religious congregation said. “He held the congregation together,” said Passionist Father Dominic Papa, the vice-postulator for the cause (case) for Father Foley’s possible beatification or even canonization. Although long remembered as a holy man by American Passionists, it was largely at the urging of Spanish and Italian members of the worldwide religious community that its St. Paul of the Cross Province in the eastern United States formally gave their support in 2006 to a canonization effort. “Shortly after he died, there was some enthusiasm among the Spanish (Passionists) to open a cause, but it never got much support from us,” Father Papa told iobserve. Father Papa explained that, at the time, other community matters seemed to be higher priorities among American Passionists. But by the time members of Father Foley’s province held a chapter (business meeting) in May 2006, a proposal to support a canonization effort passed unanimously. Later that year, a Passionist General Chapter, or worldwide deliberative gathering of the congregation, endorsed the proposal, and the cause began. Since Father Foley died in Rome, the initial investigation of his life history began in the Diocese of Rome, which is technically not a part of the Vatican. A diocesan commission headed by Cardinal Carmillo Ruini, the papal vicar for Rome, decided last year that it had accepted a petition to open a cause on behalf of Father Foley. Last week’s ceremony, held at the Reconciliation Hall of the Lateran Palace, formally opened the cause by swearing in members of the commission who will examine the arguments for and against declaring Father Foley a possible saint. “Mary Immaculate” is the titular “middle name” which Father Foley was given upon his becoming a Passionist. Like most members of the community, he rarely used it in everyday settings. The next step in the process, which would be under the jurisdiction of the Congregation for Saints’ Causes, would be to verify possible miracles attributed to the intercession of Venerable Theodore. He would then be known as “Blessed Theodore” until a second verified miracle made him eligible to be declared a saint. Father Papa explained that just getting to last week’s ceremony involved considerable research. Following church procedure, Father Foley’s principal postular (promoter), Italian Passionist Father Giovanni Zubiani, asked all the dioceses surrounding Rome to submit any materials or comments they had about the life of the possible saint. He also arranged to have a notification about the community’s petition posted on all Passionist monasteries and convents worldwide. Father Zubiani also worked with Father Papa to collect previously published biographies and correspondences of Father Foley. Father Papa, who reads English better than his Italian colleague, is now helping to compile the voluminous community correspondence and personal letters written by the Springfield native. Father Papa predicted that the diocesan phase of Father Foley’s cause may be completed in about two years. He said that while researchers are still open to receiving documentation or testimony about the possible future saint, most of the materials necessary for the process have already been gathered. Work on the case, one of several before the Diocese of Rome, now largely consists of organizing the written materials in a way that will demonstrate that Father Foley lived a holy life. Eventually, the postulators and other members of the diocesan tribunal will compile an Italian-language “positio,” similar to an attorney’s brief submitted to a judge, for consideration by the saints’ congregation. Also relevant to the process are comments made in 2006 by Pope Benedict XVI to a plenary assembly of the Congregation for Saints’ Causes. The pope expressed concern over the number of causes being promoted, and said further instructions are needed to “safeguard the seriousness of the investigations that take place in the diocese.” He added that there must be a real “fame of holiness” and not just a conviction among a small group of people, like a religious community, that the person in question was a good person. Who exactly was Father Foley, and why do some think he should be declared a saint? Those who know him said that Daniel Foley, born on March 3, 1913, lived a typical childhood on Brookline Avenue in Springfield’s North End. The son of Irish immigrants belonged to Sacred Heart Parish, one of several parishes where Passionist priests and brothers from the newly opened Our Mother of Sorrows Monastery in West Springfield preached missions. According to a 1989 biography of Father Foley written by Passionist Father Victor Hoagland, the 13-year-old Daniel was one of three altar servers at a parish men’s mission in October 1926. The late Father John Francis Vanston, the principal preacher at the mission, told the servers to stay in the church sacristy during the adult-oriented preaching. To amuse themselves, the teenagers “experimented” with Sacred Heart’s sacristy fuse box, replacing a fuse with a penny in the fuse box. The power went out, and Father Vanston was not amused. Yet a younger Passionist, the late Father Vincent Connors, took an interest in the young altar servers, and soon they were visiting and making retreats at the monastery. In January 1927, Daniel, then a freshman at Cathedral High School, wrote the Passionist provincial, asking for admission to the community. “Up to the time of the retreat, my life was filled with worldly things and God received but a small amount of time in my selfish heart, but now I feel a call to that great honor to which I am most unworthy,” the honor student wrote to Father Justin Casey. In the fall he entered the former Holy Cross (High School) Seminary in Dunkirk, N.Y. In August 1932, he donned the Passionist habit. The following year he became a formal member of the community, taking the religious name Theodore. Although the ceremony took place at the West Springfield monastery, he would never be a permanent resident there. As a novice, Theodore Foley lived in Passionist monasteries in Dunkirk, Boston, Jamaica, N.Y., and Baltimore, where he was ordained a priest in 1940. After a year studying “sacred eloquence” (preaching) in Baltimore, he remained in that city as a philosophy teacher. He was pursued doctoral studies in theology at the Catholic University of America. Father Foley’s mentor in Washington was Father Joseph C. Fenton, a priest of the Diocese of Springfield who would later become famous as a conservative peritus (expert) at the Second Vatican Council. While he would remain friends with Father Fenton and visit him in Rome during the council, his own theology was more “down the middle” than his famous teacher, Father Papa told iobserve last week. From 1944 to 1953, Father Foley taught theology to Passionist seminarians at various monasteries in the eastern United States. In 1956 he was named rector of St. Paul’s Monastery in Pittsburgh. His career changed dramatically in 1958, when his community’s general chapter selected him as one of four consulators, or assistants, to the Passionist superior general in Rome. He was the congregations’ principal superior in English-speaking countries. He had never before traveled outside of the United States. Six years later, he was elected head of the worldwide Passionists. During his first few years in Rome, Father Foley’s time was largely taken up with the challenges of his community’s rapid expansion into several new countries. But when the Second Ecumenical Council opened at the Vatican in 1960, he was placed in the middle of vigorous debates that would nearly tear the community apart in the next decade. Some Passionists, particularly its members from northern Europe and North America, interpreted the council’s call for a renewal of religious life as a call for a more “secular” mission. They favored experiments with new forms of ministry, and small group living arrangements more similar to the lifestyle of diocesan priests. Other Passionists, particularly members in Spain and Italy, vigorously wanted the community to retain its monastic traditions. As superior general, Father Foley was caught in the middle. “Much of his time was spent reassuring those who found change difficult, and in moderating the excesses of people who wanted radical change to take place,” Father Paul Boyle, himself a later superior general of the Passionists, told Father Hoagland for a 2006 article on the community’s Web site. Father Zubiani, Father Foley’s postulator agreed, telling the Italian news media last week that he was “a man open to dialogue "but firm on the principles and charism of the congregation." But the successful ministry of the late Passionist superior is not primarily explained by his administrative or diplomatic skills. His personal humility and simple lifestyle is what made him a saint, older members of the community who knew him personally said. “He never did anything to draw attention to himself. That’s why if he were living now and knew what was going on, he’d say, ‘This is not for me,’” said Father John Baptist Pesce, a former student who lives at the Holy Family Monastery in West Harford, Conn.
“However, if he was told it (the canonization cause) was something good for the church and the glory of God, he’d say, ‘Okay,’” Father Pesce told iobserve last week. Father Papa, who served as Father Foley’s personal secretary in Rome from 1964 to 1965, said that he is one of several Passionists who pray to a man they believe had the required spirituality of a saint. “Father Foley was always afraid of losing his soul,” he said.